Congratulations on the award, Nana. 😀 Glad that she got an award two years in a row (though different category). *nods* I agree. The entire program (despite being only half an hour for now) is bliss for the ears. Unless you mean a higher quality version…? LOL I thought the uploader cut it off halfway because if the lack of opening title. 8D Let’s hope there will be another next week! 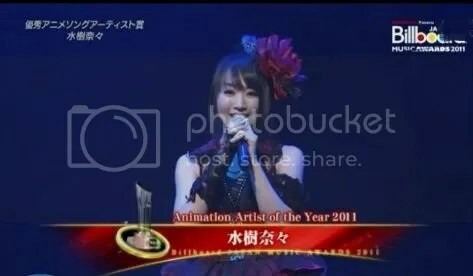 Didnt she won the price also last year? I was platinum mad when I saw last year performance. No one cheered for Nana and I saw stiff audience. Must have been hard. Reblogged this on Danny's Blog of fandom.